The Dow Jones Industrial Average projected an 18-point gain after a positive jobs report was released before the bell. Still, Hurricane Harvey – now a tropical storm – has unleashed havoc on the energy sector and suppressed oil prices on the global front. U.S. President Donald Trump will be traveling the United States to begin his pitch for tax reform over the next few days. The president will argue that tax reform is a cure to the ailment of a "rigged" U.S. economy that is working against the working class. The trip is expected to offer some relief from ongoing tensions in Washington and growing geopolitical uncertainty over North Korea's nuclear weapons program. Despite the rising threat of North Korea, Money Morning Executive Editor Bill Patalon has a way you can profit from the nation's volatility. Check out the best stock to buy to make money from the situation, right here. Today will feature a few small updates on the economic calendar. Most importantly, Automatic Data Processing reported the U.S. economy added 237,000 new jobs in August. That figure is well above the 185,000 expected by economists. This was the best report since March and another good sign for the U.S. economy as it continues to churn out new positions. Today's report is a preview of Friday's official employment report, which will be released by the U.S. Department of Labor. Warren Buffett has bet big again on the U.S. banking system. 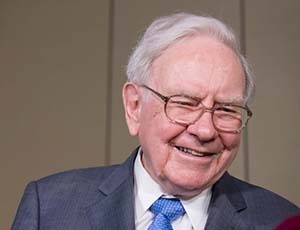 This time, his firm Berkshire Hathaway Inc. (NYSE: BRK.A) has established itself as the largest shareholder in Bank of America Corp. (NYSE: BAC). Buffett's company has exercised warrants that allow the firm to purchase 700 million shares. Get ready for the next phase of the Brexit drama. Today, UK Prime Minister Theresa May is traveling to Japan to discuss a potential trade deal between the nations. The departure of Britain from the EU will require May and other leaders from her country to establish bilateral trade agreements when the formal split occurs. While May is traveling east, other British leaders will begin the third round of Brexit talks in Brussels, Belgium. The EU is reportedly frustrated with the progress of the discussions and has said British officials have failed to begin "negotiating seriously." Crude oil prices were falling before the bell Wednesday, while gasoline futures were on the rise. Hurricane Harvey is causing a bit of a production glut in the United States, with one-fifth of American refineries currently shuttered due to the storm. The storm is now moving back toward the Gulf Coast and could bring another six to 12 inches of rain in the next 24 hours. The WTI crude oil price today fell 0.7%, while Brent crude dipped 0.7%. But Money Morning Global Energy Strategist Dr. Kent Moors is eyeing one number that indicates oil prices will see a huge rebound. Here's that important figure. Hurricane Harvey has shown us the best of America, as many people rally to offer relief to those impacted. It's also shown us the worst. So far, there have been more than 550 official complaints about price gouging in the Texas region on everything from food to gasoline. In a world dominated by the Internet, some companies are facing heat for their price increases. Today, Best Buy Co. Inc. (NYSE: BBY) is apologizing after one of its stores began selling packs of water bottles for $42.00. The battle among the nation's top retailers just got a lot more interesting. According to reports, Target Corp. (NYSE: TGT) is slashing its spending on Amazon Web Services. The retail giant wants to reduce the amount of money and its reliance on the biggest threat to brick-and-mortar retail. That means another major player is going to need to step in to provide cloud computing and other services to Target. It turns out one of Money Morning Capital Wave Strategist Shah Gilani's favorite companies is going to benefit. Look for Microsoft Corp. (Nasdaq: MSFT) to emerge as the winner. Shares of H&R Block Inc. (NYSE: HRB) were off 5% in premarket hours after the company fell short of Wall Street revenue expectations. The tax preparation giant reported a quarterly earnings per share of -$0.62. This is common for the company during quarters outside of tax preparation season. However, investors were disappointed that the company failed to match revenue estimates. Look for additional earnings reports from Workday Inc. (NYSE: WDAY), Ctrip.com International Ltd. (Nasdaq ADR: CTRP), Box Inc. (NYSE: BOX), Analog Devices Inc. (Nasdaq: ADI), Five Below Inc. (Nasdaq: FIVE), Dycom Industries Inc. (NYSE: DY), Vera Bradley Inc. (Nasdaq: VRA), Chico's FAS Inc. (NYSE: CHS), Bob Evans Farms Inc. (Nasdaq: BOBE), Shoe Carnival Inc. (Nasdaq: SCVL), Semtech Corp. (Nasdaq: SMTC), and Greif Inc. (NYSE: GEF). Fed Governor Jerome Powell Speaks at 9:15 a.m. Follow Money Morning on Twitter @moneymorning,  Facebook, and LinkedIn.